I have been going to the library for over six years now, and over those years I have saved over $5,500 using the library. I love the library because I can check out books to my heart’s content, and hang out with other book lovers my age at library events. I love books. When I go to the library, my mom has to put a limit on the number of books I am allowed to check out. Sometimes I will go to a section and pull about ten books off the shelf, then want to check them all out, but my mom will tell me to put some back (my limit now is six max). There is usually one of two reasons I want to check out so many books, either they have cool things to make or learn about, or they can take me into a different world. (Preferably one that involves magic). I go to the library twice a week. On Mondays, I go to the library to go to Teen GameZone. GameZone is 4 to 5:30 and is for teens ages 10 through 18. We can go to do a craft project and play video games. I have been going to GameZone for about a year now, and I love it. I am a slight introvert and am homeschooled, so GameZone is one of the few times a week I socialize with kids my age. (Although I do socialize with adults often, and the occasional smalls). I go on Friday to check out new books. Why don’t I check out books on Monday? I do, but Fridays are frosty Fridays! If teens check out books on a Friday, you get a free Wendy’s frosty coupon. There are other library events I attend, too. Breakfast book club, for example, is on the third Saturday of every month at 10 am. December’s book is Egg and Spoon by Gregory Mcgregor. On that same day, there is a teen hang out event at 3 pm. On the first Saturday of every month, they show a movie and have popcorn. December is Tim Burton’s The Nightmare Before Christmas, You can check out all library events on the Newton public library web page. 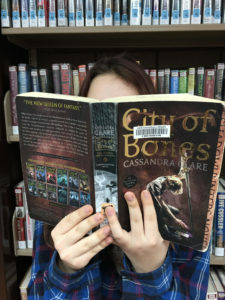 This entry was posted in Blog Post and tagged book recommendations, Books, Newton Public Library, Teens, YA, Young Adult. Bookmark the permalink.